MAX 2011 Adobe is aquiring Nitobi, creators and sponsors of the open source PhoneGap project that lets you build cross-platform mobile apps using HTML technologies, and has announced a suite of cloud services named, unsurprisingly, Creative Cloud. The announcements were made during a Monday keynote presentation at the company's Adobe MAX creative confab in Los Angeles. After the Nitobi acquisition closes – which is expected by the end of this month – PhoneGap will remain open source, with the code being donated to the Apache Software Foundation. Nitobi CTO Dave Johnson says that Adobe is "fully supportive" of this transfer. Although Adobe introduced basic PhoneGap support in the most recent version of DreamWeaver, its primary approach to cross-platform mobile development has until now been based on the Flash runtime and its packager for iOS which converts Flash apps to native code. Adobe now has two contrasting approaches – and has some tricky positioning to do, as well as the challenge of better integrating PhoneGap with its tools. 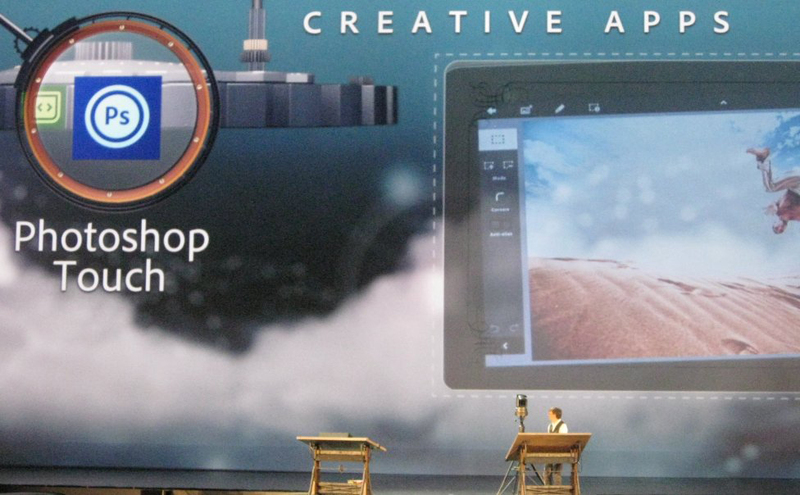 Creative Cloud was announced in conjunction with a new range of content-creation apps for tablets. These apps use the cloud services to store and transfer files, with 20GB of storage available. The new apps include Photoshop Touch, Carousel for managing photos, Kuler for color selection and matching, Collage for assembling images on a virtual board, Debut for viewing Creative Suite files and marking them up with comments, Ideas for vector-based drawing, and Proto for sketching out wireframe prototypes of websites and mobile apps. These touch apps will be initially available for Android, with iOS versions to follow next year – although Ideas is already available for iOS. Tablets will need to have at least an 8.9-inch display with 1280-by-800 resolution. There was no announcement about other tablet operating systems – sorry, BlackBerry PlayBook–owning creatives. Both of you. In addition to these apps, Creative Cloud includes Business Catalyst for website design and hosting, and Digital Publishing Suite services for publishing magazines as apps for iPad, Android, and BlackBerry Playbook tablets, as well as desktop computers. A new Digital Publishing Suite Single Edition opens the service to small publishers at $395 per app, but supports Apple iPad only. Some Creative Cloud subscription types will also include subscriptions to the Creative Suite desktop applications including Photoshop, InDesign and Illustrator. Full pricing for Creative Cloud will be announced in November. Adobe also announced the acquisition of Typekit, a private company specializing in hosted web fonts, and the full release of Flash Player 11 and AIR 3, which will be available for download shortly. A notable aspect of the MAX keynote was little direct mention of Flash, an absence that supports the notion that the company is now presenting itself as an HTML and mobile app company. The Nitobi acquisition also raises the question of whether Flash or PhoneGap will be more prominent in Adobe’s mobile development tools.